There is no silhouette more symbolic of Toledo than that of the Alcázar of Toledo. The commanding, square-shaped building - which is anchored by its four, sky-reaching corner towers - crowns the city, and has roots that reach back deeply into the ancient capital’s history. While structures on this site date back to Roman times, the version you see today was largely erected in the 16th century under Carlos V, and has since been through many fires, reconstructions, and additions. Though it once served as home to royals (among other purposes), it now houses the country’s Military Museum, which offers an in-depth look at the nation’s past, complete with an impressive viewing terrace that overlooks the city. While the museum is situated within the Alcázar, it doesn’t tour the fortress itself per se, so those keen to see the structure may be more satisfied just viewing it from outside. Note that the museum closes on Wednesdays, and is free to enter on Sundays. Hours: 10:00 a.m.-5:00 p.m. Closed Wednesdays. We will start the tour visiting the Royal Monastery of El Escorial that Philip II had built as a residence and Royal Pantheon. It is an impressive construction of great historical-artistic and architectural value. We will continue to the Valley of the Fallen, an extraordinary and controversial building site of architecture, sculpture and erected engineering in honor of the fallen in the Civil War.We will return to Madrid for a short break with free time for lunch (not included) and thus be able to regain strength for the second stage of this wonderful guided tour.Upon arrival in Toledo, we will have a Panoramic Tour followed by a Guided walking Tour of the surroundings of the main monuments to discover the admirable Cathedral, the Jewish Quarter, the Alcazar and other monuments.Then, you can continue enjoying the city at your leisure.We will return to Madrid with unforgettable memories of one of the most amazing local tours. 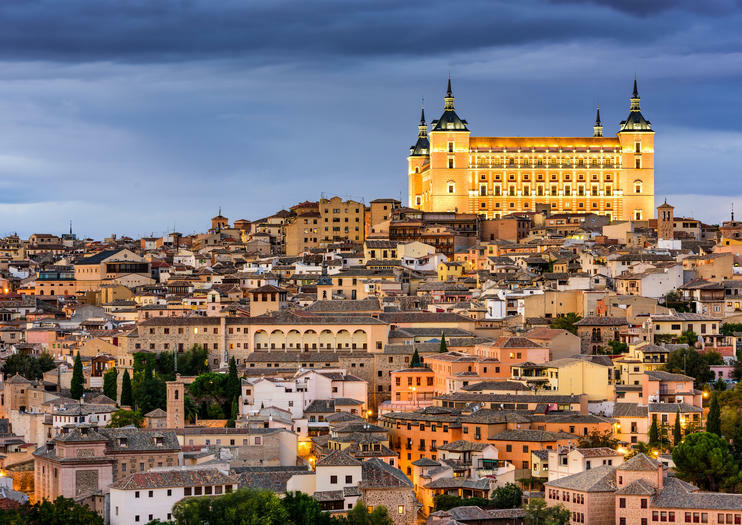 When visiting Madrid, take advantage of the opportunity to visit the nearby UNESCO World Heritage–listed city of Toledo. On this full-day guided tour, learn about the unique multicultural history of Toledo while visiting its old Jewish quarter, imposing Alcazar fortress, Gothic cathedral and other landmarks. Explore the winding medieval streets on your own during leisure time, and choose between the different options to Access the Cathedral and enjoy a traditional Spanish lunch at a top-rated local restaurant.